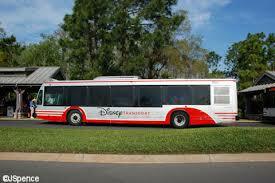 I love riding the Disney Transport bus, when I am at Walt Disney World. I am a bus driver in my at home life, so it is no big deal. In fact, sometimes it’s nice to have someone drive ME around! But, with so many people from so many different places, it’s easy to forget that not everyone has, or makes use of, the public transit system. As a result, it could be even easier to miss that there may be some who have never been taught the proper bus etiquette when using Disney Transport. So, we’ll try to look at a few of those here, today! 1. Be patient, especially with those who are in ECVs or wheelchairs. You never know what someone’s ailment may be, but keep in mind that Disney drivers are professional and do a great job helping these guests quickly to get everyone else moving. 2. This is for the Men…be a gentleman! If an elderly person, or a lady with a baby, comes aboard, get up! Most of the rides around WDW are 20 minutes or less! I know at the end of the day, it’s easy to say we’re tired, but chivalry needs a little resurrection! 3. If you have a stroller, either move to the rear of the bus or fold the stroller up. This will allow for more people to join you in the excitement of going to one of the parks. This is an incredible courtesy, and also happens to be a federal law. 4. While waiting at your Resort Depot, allow those coming off of the bus to proceed first. This will help the exchange of passengers go quicker and you will be off to your destination in no time. This isn’t a problem at the parks because of the use of switchback queues. 5. Be courteous to your drivers. They are working hard to provide you the safest and friendliest ride. In many cases, the Bus Drivers are the first people we come in contact with, and they are a fabulous source for information and assistance. We left a backpack at the Port Orleans – Riverside on our way to Animal Kingdom. We asked the driver if there was a way to check. He got on the radio and within a few minutes, they had the bag and told us where we could recover it. That’s service! If we all strive to make use of these few simple rules, everyone’s vacation just might feel a bit more magical, don’t you think? Have a blessed and Magical evening!! Previous Previous post: Remembering Walt!